Fifty years since Soviet cosmonaut Alexey Leonov made the historic first step into space, RT is bringing you special coverage – and a chance to have your question answered by the pioneer spacewalker himself. 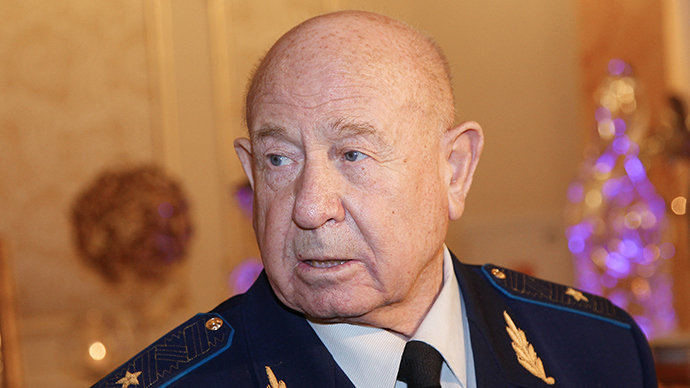 The man who braved open space that day was pilot Alexey Leonov, who also later commanded the Soyuz 19 ship during the first joint Soviet-American space mission, Apollo-Soyuz, in 1975. On Wednesday, RT begins its special coverage on Leonov’s historic 12-minute spacewalk, which will continue into Thursday with a live feed from Moscow Museum of Cosmonautics featuring Leonov. Speaking at the exhibition dubbed ‘50 years: 733 spacewalks’ the cosmonaut will share the story of his spacewalk with the viewers. RT Russian will broadcast the entire event on YouTube. But that’s not all, with social media users in for a real treat: RT will follow questions posted under hashtags #askacosmonaut or #спросикосмонавта, as well as those under RT’s Facebook post, and ask some of them to Leonov. The event, organized and covered by Roscosmos, Google and RT will be the first in the broader joint project titled #Spaceology15. Dramatic details of Leonov’s pioneering walk, which nearly cost him life, emerged only after the fall of the Iron Curtain. Due to unexpected pressure problems his spacesuit inflated like a balloon, preventing him from returning to the capsule. Leonov had to risk getting decompression sickness by ‘deflating’ the suit. But the risk was well justified for Leonov. Back in 2010, the cosmonaut told RT’s Maria Finoshina what he saw and felt when he first entered open space. “I am often asked about my feelings. But this is the classic idea of feelings – how you experience your surroundings. Blue Earth, bright Sun, black sky, non-blinking stars. They are seen at the magnitude of six in space, and only at three on Earth. So the sky is filled with the glowing dots. And you feel the depth,” Leonov said. The crew then experienced more troubles with oxygen and had a dangerous re-entry malfunction, eventually landing at an unplanned location in the middle of thick Russian taiga forest, with subzero temperatures, wolves, bears and a snowstorm outside. All those details were kept secret up until recently. Years after he retired in 1991, Leonov has remained an extremely popular and authoritative public figure, and has generously shared never-before-heard details of space exploration. Speaking to RT, he strongly refuted a popular conspiracy theory about Americans ‘staging’ the moon landing. “That is ignorance, total ignorance on the part of those who say so. These people don’t know anything about technology, or perhaps they are simply ready to say anything to get on TV… The Americans had announced the time of the moon mission launch beforehand. We were there at the Soviet military base and we could see the launch. I swear to God that we sat there with our fingers crossed and hoped the guys would make it. We wanted this to happen… The radars kept track of everything, even the way their engines worked... Their external cameras were on and they started showing a panoramic view of the area around the ship… We could see everything they did with our own eyes,” Leonov stressed.